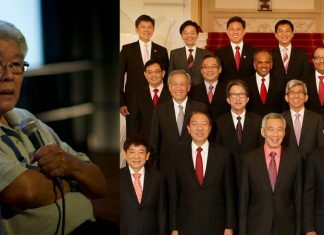 The success of major policies that Singapore is undertaking hinges on one key factor: the trust citizens have in the Government, said Prime Minister Lee Hsien Loong said yesterday. (The Straits Times, October 1). What does the King James Bible have in common with Shakespeare’s Macbeth and The Straits Times? They are all available in print and you have to borrow or buy them. Not even the word of God was free in Shakespeare’s time. The King James Bible was originally sold leaf-leaf for 10 shillings or bound for 12 shillings, according to Wikipedia. If you are too young to remember when people bought and sold and were paid in £sd (pound, shilling, pence) in Britain, 12 pence made a shilling — and 20 shillings, a pound. Costing 10 or 12 shillings in Shakespeare’s time, the Bible was expensive. Actors were paid a shilling a day by an Elizabethan theatre company, Philip Henslowe’s The Admiral’s Men, according to the Internet Shakespeare. Singapore today, of course, has free newspapers. But do you remember how they came about? Today was launched in November 2000. By then we could read almost every online newspaper — The Times, the New York Times, the Guardian — for free. Even printed newspapers were available for free in many cities. The freesheets, as they were called, and the free websites all hoped to make money from advertisers. How times have changed. The New York Times is no longer free. Even bloggers are trying to “monetize”. Andrew Sullivan, one of the most popular bloggers in America, has become like the Straits Times. You have to pay to read his full posts. Across the Causeway is the subscription-only Malaysiakini. I love free websites as much as anyone else, but are they sustainable? Ultimately someone has to pay for the content: either the readers or the advertisers or the site owners themselves. Four years ago, in 2009, the New York Times publisher Arthur Sulzberger Jr compared the print media to the Titanic and the digital media to airplanes. If so, websites are like the early flying machines when you didn’t know how long they could stay in the air. Still, intrepid flyers went up and took their chances then. And so is The Independent Singapore today along with a raft of other websites on this little island. Pardon the mixed metaphor. I am trying to look into the future, but the view is obscured by the elephant in the room. I dare say whoever comes up with a website just goes ahead, elephants be damned. That may seem reckless but has acquired a different nomenclature. When a serious publication or website is launched, it’s called philanthropically funded journalism or philanthro-journalism. The category includes winners like the online ProPublica, which has won Pulitzer prizes. But the best example perhaps is the Guardian, whose late owner, John Scott, put all his shares into a trust to keep the newspaper running.The Guardian has not only survived but remains one of the leading British newspapers. As a left-of-centre quality daily, it has certainly provided diversity. That’s what websites here hope to provide: variety. Here’s to tomorrow.